Drake performs during the Summer Sixteen Tour inside the Wells Fargo Arena in Philadelphia on Sunday Aug. 21, 2016. Glowing drones, flying cars, CGI mermaids, and an NBA court-size stage that turns into an iPhone were a few of the touches that made Drake's Saturday night stop in Philadelphia the most 2018 arena concert of 2018. Filing the first of two back-to-back dates at the Wells Fargo Center, the Torontonian coaxed out a number of Canucks living among us, rocking maple leaf gear in support of their favourite son. But the rapper whose Canadian passport reads Aubrey Graham didn't show up alone. The “Aubrey and the Three Amigos” tour also brought along opener Roy Woods, a multi-threat OVO Sound artist. Then there’s Migos, the multi-platinum group who hand-delivered hits from every spot on the sparse stage, skulking in green, red and yellow paratrooper suits that had the swaggering Atlanta trio looking like trap M&Ms. Most were really there to see Drake, who at 31 is confident enough in his powers to carry a 90-minute set without the aid of a band. Starting with the Kanye-needling Scorpion track "8 Out of 10," which saw him operating inside gauzy projection screens, Drake was this show's sole proprietor for much of the evening. He wasn't hurting for material. Drake has racked up so many radio hits, in fact, that he opted to trim some into medleys. Slivers of "Both" and "Jumpman" found use in a call-and-response; elements of "For Free" and "The Motto" worked up to the re-intro of Migos, who joined Drake for shared hit "Versace." 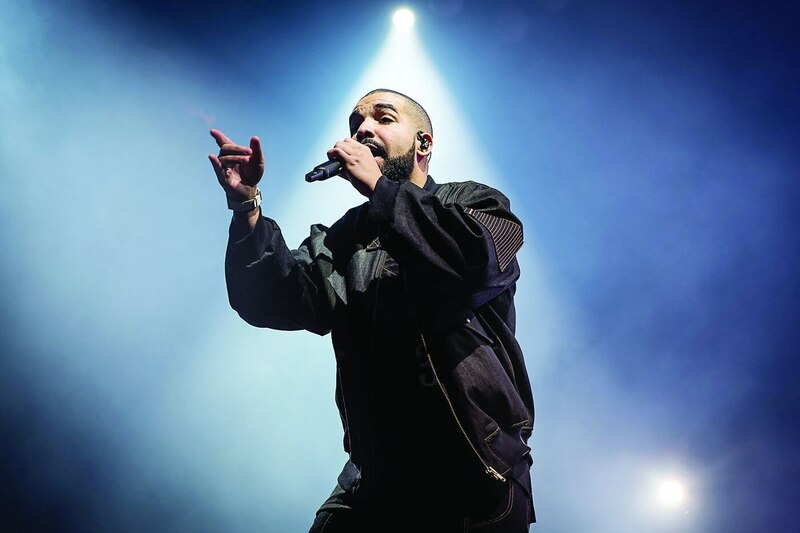 Shifting between wait-for-the-drop bops and wistful crooning, Drake is a high-motor performer, though he relied on a backing track to fill in the blanks. Gadget-nerd spectacle filled in the rest, starting with a banana Runt-yellow replica Ferrari that floated around the lower bowl. Color-changing drones swarmed above Drake's head like a school of fish during "Elevate," while the space-age stage swapped its look from a busy iOS homescreen ("In My Feelings") to a tranquil ocean scene, complete with animated aqualadies ("Hotline Bling"). Drake is known for his digital dexterity, possessing a Black Mirror-like grasp on social media's dark power that decided his 2015 feud with Meek Mill. That's all over now, and no one seems more eager to let us know than Drake, who turned the hometown crowd into a shrieking, crying, prideful mess by bringing Meek out to run through his anthemic "Dreams and Nightmares (Intro)." The guy can toss out all the techy bells and whistles he wants — nothing excites Philadelphia more than a Philadelphian.